1. Jeter's up the line, cutoff, shovel pass to nail Giambi at home to save a 1-0 victory and keep the Yankee season alive in Game 3 of the ALDS vs. Oakland ( a game I attended! ). 2. 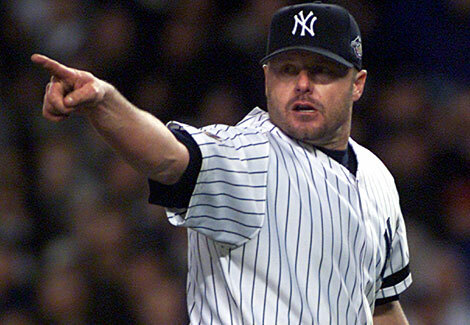 The Yankees storm back after down 2-0 in the series to eliminate the A's behind Clemens and Rivera. No team had ever come back to win a 5 game series after losing the first two at home. 3. Alfonso Soriano's walkoff homer in Game 4 of the ALCS against Seattle. 4. Game 5 of the ALCS. The Yanks clinch their fourth straight AL pennant. Their 38th overall. The customary champagne shower is curbed out of respect for the tragic events of September 11th. 5. Game 3 of the World Series. 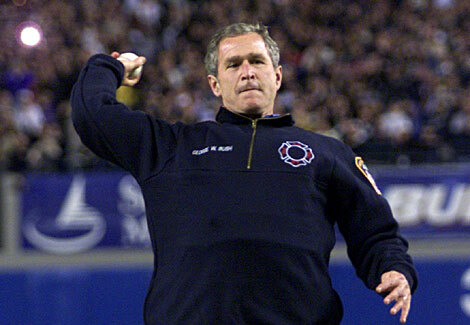 Amid the tightest security ever at a baseball game, after anthrax scares and the threat of more terrorist attacks, the commander in chief (George W. Bush) walked solo out to the pitching mound, dug in, and threw a perfect change-up for a strike. 6. Watching the tattered, frayed, missing several stars, American flag; the WTC flag, recovered at Ground Zero fly proudly out in centerfield, as for the first time ever, F-14's flew over Yankee stadium. 7. Game 4's comeback. Trailing 3-1 and down to their last out Tino Martinez ties it with a home run. Then as the clock and calendar move into November, Derek Jeter (Mr. November) wins it with his home run. 8. Game 5's comeback. Trailing 2-0 and down to their last out Brosius ties it with a home run. 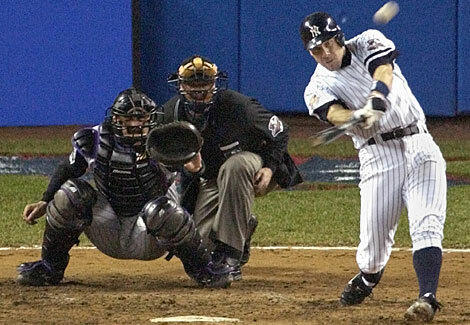 Soriano then singles Knoblauch in the 12th to complete the greatest back to back comebacks in world series history. 9. Challenger, the bald eagle soaring into the stadium from centerfield as Irish tenor Ronan Tynan sang "God Bless America". 10. When the "NY" on a baseball cap meant so much more than baseball.